based on those letters, which recounted the details of his experiences and also served as an outlet where he could express the terror, tedium and even boredom of his daily life while in Vietnam. It tells the story of the Vietnam War as this foot soldier viewed it from the jungle, as both a rifleman and a combat medic who was forced to learn his medical skills under fire, and who later became a personal waiter in the private mess hall of Major General E.B. Roberts, the Commanding General of the 1st Cavalry Division (Air Mobile). The story begins with a record of Wises military history, his training as an infantryman in Leesville, Louisiana and his arrival in Vietnam on May 2, 1969. Chapter two details his first experience under enemy fire on May 11, when suicide squads penetrated their perimeter with the purpose of inflicting the maximum amount of damage with disregard to even the attackers' own lives. Chapters five and six recount the August 1969 battle of LZ Becky, a landing zone that was constructed just south of the Cambodian border and was destroyed only four weeks later. Chapter seven relates Wises experiences after receiving a job as a waiter in the Commander Generals mess hall. On April 9, 1970, his service ended and he headed home. 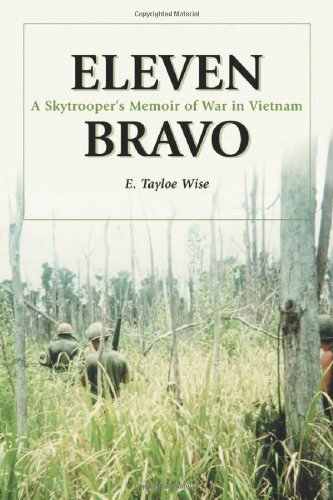 The book contains diagrams of several battles and the authors personal photographs taken while he was in the jungle and in the rear echelon area of Phuoc Vinh.